Central bank chairman gets support from some key senators, but even praise is qualified, while others offer harsh attacks. Federal Reserve Chairman Ben Bernanke was under fire at his confirmation hearing Thursday. Should Ben Bernanke be confirmed for a second term as Fed chair? Senate Banking Committe chairman Christopher Dodd, D-Conn., said he supports Bernanke's confirmation, but wants to take away some of the Fed's powers. NEW YORK (CNNMoney.com) -- Federal Reserve Chairman Ben Bernanke got a rough going over from both his supporters and detractors at his Senate confirmation hearing Thursday. Even some of those who praised his actions during the financial troubles of the last two years, such as Senate Banking Committee Chairman Chris Dodd, balanced that support with arguments that the central bank should be stripped of some of its bank regulation powers due to its past failures of oversight. While many Democrats on the banking panel joined Dodd in saying they would vote for another four-year term for Bernanke, some of the Republicans questioned whether they could support the chairman who was first appointed by President George W. Bush. One long-time Bernanke critic Jim Bunning, R-Ky., said he was ready to do everything he could to block or delay the confirmation, joining a similar threat made late Wednesday by Sen. Bernie Sanders, the Socialist senator from Vermont who is among the 60 members of the Democratic caucus. The threat of a filibuster by Sanders and Bunning, two senators with diametrically opposed views on most issues, shows the breadth of anger faced by Bernanke sparked by the Wall Street bailouts of the 15 months. A filibuster would mean that Bernanke would need to get at least 60 votes, rather than the simple majority of 51, in order to be confirmed. And the questions by Dodd and others about the Fed's continued role as a bank regulator raised questions about how Bernanke will be able to do his job if he is confirmed for another term, which is still widely expected. Dodd said Bernanke and the Fed deserved credit for the steps taken in the financial crisis of a year earlier to stop the economic crisis from becoming significantly worse than it did. "I believe you are the right leader for this moment in the nation's economic history and I believe your reappointment sends the right signal to markets," Dodd said during his opening statement. But the committee's ranking Republican, Sen. Richard Shelby of Alabama, was far more critical of Bernanke in his opening statement, telling Bernanke "I fear now our trust and confidence (in the Federal Reserve) was misplaced." "Not everything that went wrong depends on the system because that system also depends on the people who run it," he told Bernanke. "It's those individuals who need to be accountable for their actions or their failure to act." Still, despite the implication that he couldn't support confirmation, Shelby did not say how he intended to vote. Two of the Republicans on the committee, Judd Gregg of New Hampshire and Bob Corker of Tennessee, did praise Bernanke and said they would vote for his confirmation. "The simple fact is if you hadn't been there and been willing to take extraordinary action last fall and last winter and in early spring...it's very likely we would be experiencing a depression or if not a depression then certainly a recession that is radically more severe," said Gregg. 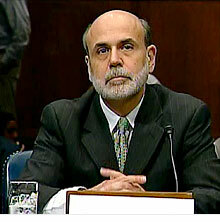 The next step in Bernanke's confirmation would be a vote by the committee, which has not yet been scheduled. Corker said he is certain Bernanke will be confirmed, although he held out the possiblity that the full Senate might not vote on confirmation until it was done with debate about reforming financial regulation. But he said that under law, Bernanke would stay in the top job at the Fed, even if the confirmation vote did not occur before the end of his term as chairman on Jan. 31. But there was a lot of talk even from Bernanke's supporters on the committee, both Democrat and Republican, about the need to limit the Fed's role as part of an overhaul of financial regulation. Dodd has proposed legislation that would strip much of the bank supervisory duties from the Fed, giving them instead to a newly created authority. He said it might be better if the Fed simply focuses on using monetary policy to support economic growth and fight inflation while maintaining a stable financial system. Dodd also said the financial crisis is at least partly due to poor supervision of the banking sector by the Fed. "I admire what you've done over the last two years," he said. "But we shouldn't have had to go through what we did for the last two years had there been cops on the street, doing their jobs, telling us what was going on and allowing us to avoid the problems in the first place." "Why should I give an institution that failed in that responsibility the kind of exclusive authority we're talking about here?," Dodd asked. Bernanke responded that the Fed could not have taken the steps that Dodd had praised to stabilize the financial system if it were stripped of its role as banking regulator. "There's no way we could have been as involved and effective in this crisis if we did not have that knowledge and expertise," he said. Bernanke also opposed a proposal that recently passed the House Financial Services Committee to give the General Accountability Office power to audit the Fed's monetary decisions, saying that it would be seen by investors as giving Congress the power to pressure the Fed to reverse or delay unpopular rate hikes. He said if there are increased worries about Congressional interference in Fed activity, the central bank would not be able to stop real rates from rising because investors would demand higher yields on bonds. Questioned by Sen. Robert Bennett, R-Utah, about the risk of a return of soaring inflation of the late 1970's, and whether the Fed would have to raise rates to the record highs of that era to once again to conquer such runaway prices, Bernanke said he was confident there is not a risk of a return of such inflation. But he added that the ability of the Fed to beat inflation at that time was a "case study" of why Congress should not audit monetary decisions of the Fed. Bernanke admitted that the Fed made mistakes in supervising the banking system ahead of the financial crisis, and promised to do better. But he said that supervision is already improving, and that it would be a bad idea to strip the Fed of its powers. "If you fight a battle and lose the battle, does that mean you never use the army again? You have to improve and fix the situation. You don't have to necessarily eliminate the institution," he said in response to one of Shelby's question. "We didn't do a perfect job by any means, but I don't think we stand out as having done a worst job than other regulators." Bunning, the only member of the Senate to vote against Bernanke when he was first nominated to head the central bank four years ago, was again his harshest critic. Bunning said Bernanke and previous chairman Alan Greenspan were responsible for helping to inflate the housing bubble whose bursting caused the housing crisis, and that the Fed continues to create more problems by pumping too much cheap money into the system. At one point Bunning even slipped and referred to Bernanke as "Greenspan," prompting chuckles from both the chairman and his critic. "You put the printing presses into overdrive to fund the government spending and hand out cheap money to your masters on Wall Street, which they used to rake in record profits while ordinary Americans and small businesses can't get loans for their everyday needs," Bunning said. "Where I come from we punish failure, we don't reward it." He attacked Bernanke for the bailout of American International Group (AIG, Fortune 500) and a recent report from an inspector general that the Fed should not have paid 100% of the money owed by AIG to leading financial firms. "The AIG bailout alone is reason enough to send you back to Princeton," Bunning said, referring to where Bernanke taught before entering government. 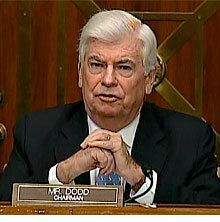 Dodd joined Bunning in his criticism of the Fed's handling of those payments in the AIG bailout. Bernanke answered that he did not have the leverage to force those banks to accept lower payments, known as a "haircut," during those negotiations. "The only way to get the haircut is to have a credible threat that if you don't take the haircut they're going to go bankrupt and you're going to lose everything," he said in response to a question later in the hearing. "And since we had intervened to prevent AIG from going bankrupt, it just wasn't credible." Bernanke insisted that what was done to bailout Wall Street was done because of the impact further failures would have had on Main Street. "I'm not a Wall Street person. I'm an academic. I come from a small town," he said. "I did it because I knew from my studies that the collapse of the financial system would have extraordinarily bad consequences for Main Street. And I firmly believe we did the right thing."